Me: "Lord-you've got to be kidding me." Him: "Don't be a sissy." Me: "Sissy?!? I just came all this way in a 3rd world country by myself!" Him: "You were never by yourself. You give yourself too much credit. Now hang onto your skirt, climb up on that man's back and enjoy your journey." So I did. I have to admit I stomped my feet all the way over to a man. He was getting teased by the other men that it was his lucky day getting to carry a white lady across the river. I climbed on and held on tight and soon all I could hear was the rushing river water and instead it making me more scared it calmed me instantly. I looked up at the mountains and their beauty-The beauty of God's creation. 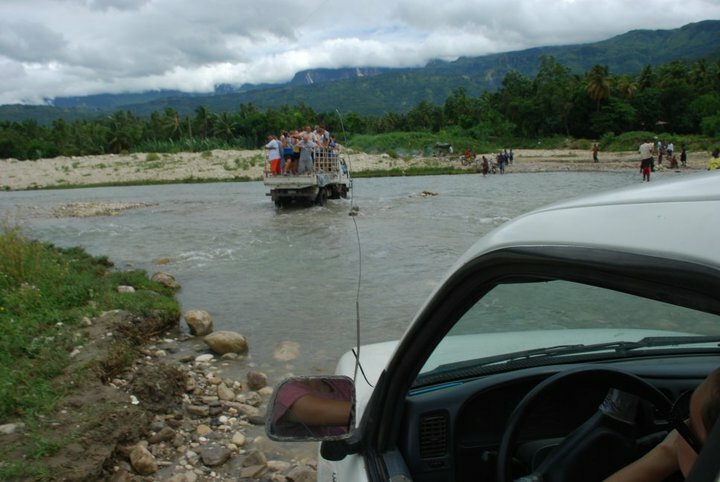 I had seem those mountains a hundred times but never from the view of a Haitian's back in the middle of the river. I learned that day to not to forget to enjoy the journey God has planned out for me. Sooooooo....I took another motorcycle into town and he was driving like a maniac and giving me a huge headache on all the bumps and pot holes. I told him he could stop, I paid him and checked the time. 7 minutes until class. I held onto my skirt and started running down the path to the church. I made it there on time and to my delight all 7 mothers were there for class! They all even got there before me! I took a deep breath remembering how discouraged I was the week before when One mother showed up alone. I had prayed and asked God if this is not what He wanted to see me do in the village to please close this door and open another wide so i wouldn't miss it. That was last Monday. This Monday the truck was finally fixed after 14 days. Thank the Lord! I went out to Peredo for class and there were 11 mothers there. Some others in the village heard about the class and wanted to join. I felt bad but had to turn them away. I don't have a big budget for this class and want to be able to "micromanage" this first class. I had already evaluated all of them and their home situations. These extra mothers begged me to start another class with their babies. I told them they could sit in on the class that day and I would see their babies after class. I checked the 4 babies and they looked OK. I thought back 2 weeks before when I felt like I was begging mothers to come to this week where I was turning them away. My class runneth over. Praise the Lord! I am posting a picture of one of the moms in the nutrition class. Her name is Elenal. She is 31 yrs old. Her first husband died and her current husband went to the Domincan Republic to work. She told me he has been gone for months and hasn't sent any money yet. Elenal has 5 children. theyoungest pictured here is 3 months old. She is having a hard time raising her kids alone. When i visited her house she told me she is borrowing food from neighbors and has to repay them. I went to the market that day and bought them food for 3-4 days. One of her daughter attends our school in Peredo. She has a son who looked to be about 10 yrs old and has never been to school. He was cutting weeds in the yard with a machete when I was there. She is very interested in the class and you an see her love fo rher children. Please pray for Elenal specifically in the nutrition class. Her family can greatly benefit from this program. What a wonderful work you are doing for the Lord. Your post is so very encouraging. God bless you.